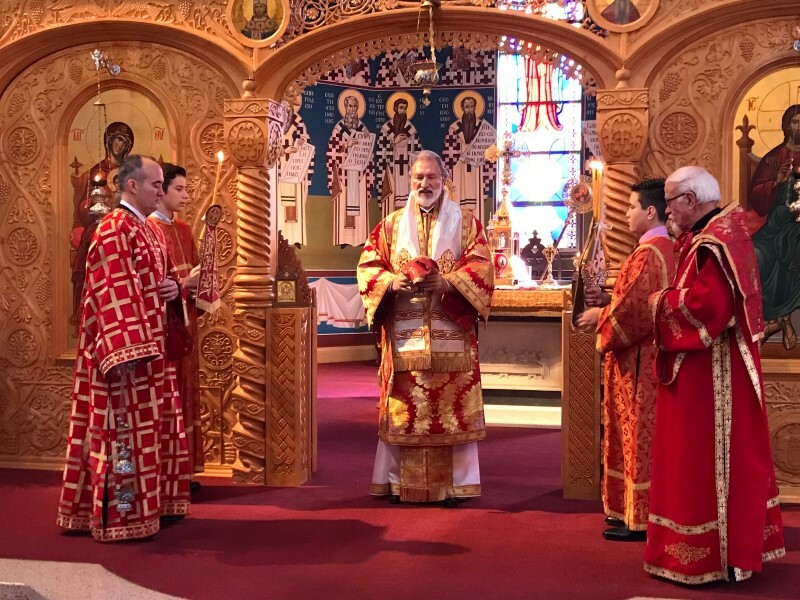 On the American National Holiday of Thanksgiving, November 23rd, 2017, His Grace Bishop Irinej of Eastern America celebrated the Hierarchical Divine Liturgy with concelebrating clergy from the Cleveland and Pittsburgh Deaneries at the St. Sava Cathedral in Cleveland, Ohio. 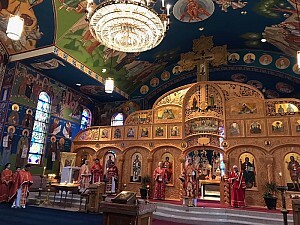 Among the celebrating clergy were the Deans of the Pittsburgh and Cleveland Deaneries, Protopresbyter-Stavrophor Rade Merick and Economos Dragan Goronjic; together with Archimandrite Leontije (Alavanja) of St. Mark's Monastery and Protosingelos Sava (Medakovich) of New Marcha Monastery; joined by Protopresbyters Mijoljub Matic and Dragoslav Kosic of Cleveland; Economos Bosko Stojanovic of Youngstown; and Presbyters Sinisa Hrvacevic of Lorain and Vedran Grabic of Hermitage; assisted by Protodeacon Ljubisa Mitrovic of Cleveland and Deacon Theodore Sokolovic of Chicago. Responses were prayerfully rendered by the Njegosh Serbian Singing Society of Cleveland. Among those present, in the spirit of Thanksgiving, were two visiting Lutheran pastors and their wives. In his festal homily, His Grace reminded everyone that the origins of Thanksgiving are from various harvest celebrations that are traditional to Christians in general and the Protestants in specific. The Thanksgiving holiday tradition can be traced to a 1619 event in Virginia, and a 1621 celebration at Plymouth, Massachusetts. The first President of the United States, George Washington, proclaimed the initial nationwide Thanksgiving celebration in America marking November 26, 1789, "as a day of public thanksgiving and prayer to be observed by acknowledging with grateful hearts the many and signal favours of Almighty God." Thereafter, Thanksgiving was officially called for in all states in 1863 by a presidential proclamation of Abraham Lincoln, who proclaimed the date to be the final Thursday in November. However, the Feast of Thanksgiving is also an essential Orthodox Tradition. For every Divine Liturgy is the Service of Thanksgiving. The word Eucharist, comes from the Greek word, Ευχαριστία, which is proclaimed in the Liturgical summons, "let us give thanks unto the Lord", to which we respond, "it is meet and right". The Bishop reminded those gathered that the late theologian, Fr Alexander Schmemann, defined man as - homo adorans - a "man of worship", who finds his true fulfillment in Liturgy. The first and basic definition of man is that he is priest. He stands at the center of the world and unifies it in his act of thanking God, by receiving the world from God and offering it to God. In celebrating what was to be his last Liturgy on earth, in his brief, but remarkable and homily, titled "Thank You, O Lord", Fr. Alexander began by noting, "Everyone capable of thanksgiving is capable of salvation and eternal joy" and concluded with his last words affirming, "Lord, it is good to be here! Amen". Today, this same sermon is a steadfast part of the contemporary Orthodox celebration of Thanksgiving. Following the Divine Liturgy, everyone joined in fellowship for a light Agape Meal, prepared by the St Petka Circle of Serbian Sisters, to give thanks to the Lord for all of our bounties. Thank you, Lord, for everything. It is truly good to be here! Amen.